On a cool Tuesday morning, I sit in a corner and watch the frenzied activity in the studio at Oglebay Institute’s School of Dance in Wheeling. The participants move quickly, in varying directions, some to the music and some, seemingly, to their own inner tempo. They are rather curious about my presence, and no matter where I try to crouch to capture a photo, I seem to be in the way. They utilize the entire square footage of the studio, and the excitement is palpable. One dancer approaches my notebook and snatches up my pen, adding her own notes to my list. Then she smiles at herself in the mirror and flings the pen. 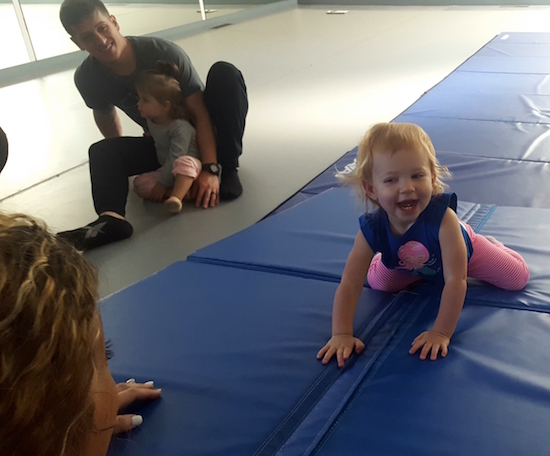 Such behavior is not only permissible, it’s expected, because this is Baby and Me Class: 45 minutes of dance, tumbling, and movement for children ages 1-2 and their parents or caregivers. Baby and Me is currently offered on both Tuesday and Wednesday mornings. Tuesday’s class is taught by Arianne Wade; Kim Kafana teaches on Wednesday. Both teachers have extensive dance experience and teach students of all ages. Dancing, Marching, Hula Hoops & Tunnels! Arianne starts the Tuesday rugrats with a warm-up that involves toe-touching, and then the class moves into marching and dancing. Some of the parents march with greater verve than their kids; some of the kids find occasion to venture off on their own. There’s no pressure for anyone to conform. Children are encouraged to participate if they wish and allowed to entertain themselves, too. After marching comes hula hoops and tunnel-crawling. 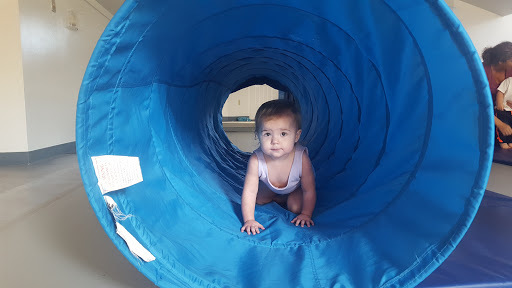 The latter is always a favorite, because the toddlers get a huge kick out of crawling to the center of the tunnel and remaining in an inaccessible spot, thereby requiring their parents to crawl around on creaky knees, coaxing and cajoling them to come out so the next child can have a turn. Instead, they all pile up in there and laugh hysterically. I’ve been here before, as the mother of a participant. Both of my sons took a Baby & Me class at OI’s School of Dance, and it turned out to be a good way for me to connect with other parents during the difficult and sometimes lonely, early years of motherhood. Though life with a baby or toddler brings both joyous change and difficult challenges, it’s an isolating time for many stay-at-home parents. In times past, families formed a community, with grandparents, aunts, and uncles living together. Now, many young parents aren’t fortunate enough to have the immediate support of nearby relatives. This isolation can be crippling, which is why it’s so important for new parents to connect with each other. 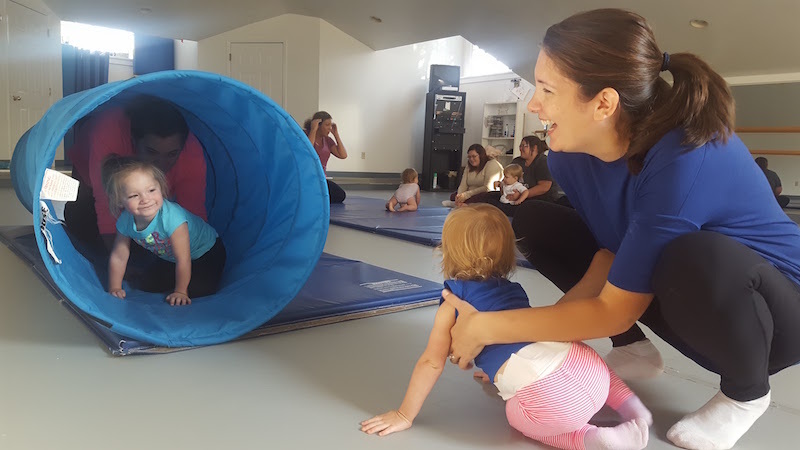 Cheryl Pompeo, director of Oglebay Institute’s School of Dance, is pleased to be able to offer Baby and Me classes to the community. I asked her about the benefits of the classes, and she confirmed that they aren’t just for babies to make friends. In some instances, Baby and Me has actually led to a lengthy experience with OI’s dance program. “We’ve had some kids that started in Baby and Me and have participated in our dance classes until they graduated high school,” Cheryl told me. Nobody cries on Tuesday. In fact, they’re incredibly excited for the bouncy part of class, so excited, in fact, that Arianne has to stash the trampoline in the elevator so the wee ones won’t see it ahead of time. She lines them up and they crawl away. She lines them up again, ever the patient instructor. They crawl away. With their parents’ help, she works with them on their forward and backward rolls. Reactions range from glee to cautious disinterest, but Arianne offers gentle encouragement, and when each child has completed the flip, all of the parents cheer in a unanimous display of support. This is camaraderie. This is community. As I walk home, I remember how Kim Kafana and the other parents took turns helping my son march, bounce, and somersault because I was so pregnant with his brother. I’m still friends with some of those women, and my boys have been tumbling at the School of Dance for years. Baby and Me Class is not particularly calm or quiet. In fact, it’s what I’d call organized chaos, much like the raising of small children. By the end, the kids have socialized with one another, as have the parents. It’s a happy morning, and I can only hope that the little ones got home before they fell asleep in the car. Register for Baby & Me and More! Oglebay Institute’s Winter Session Classes begin January 8, 2017. Please visit www.oionline.com for a list of classes.